Tune into YU’s Internet Radio Show, Thursday at 2 P.M.
Yeshiva University’s Institute for University-School Partnership convened 14 principals of Jewish day schools from across the country for a Critical Friends Group retreat on May 9-10. The two-day conference in Ridgefield Park, NJ, was the first of what will be an ongoing process of leadership support and growth opportunity for this group. Similar retreats have been facilitated by the School Partnership in the past and others are being planned for the future. 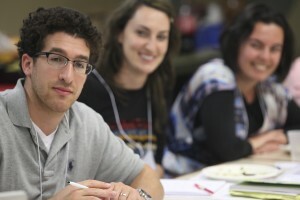 Two new teaching fellowships offered by the Institute for University-School Partnership at Yeshiva University’s Azrieli Graduate School of Jewish Education and Administration aim to increase the number of qualified Jewish educators, particularly outside the New York tri-state area, by enabling recent graduates to combine their studies with placements in schools.